Zebraliśmy i przeanalizowaliśmy 44 ekspertów oraz 747 użytkowników z międzynarodowych źródeł. Eksperci ocenili ten produkt na 79/100 oraz użytkownicy oceniają go na 95/100. Średnia data opinii to 10-10-2017. Porównaliśmy te opinie do 1153109 opinii z innej Aparaty cyfrowe. alaSCORE™ dla tego produktu wynosi 96/100 = Wyśmienita. Ostatnia aktualizacja: 18-04-2019. The Nikon D3400 is the company's entry-level model, which is designed to get those who are new to DSLR photography on the bandwagon – and in theory, to potentially make them customers for life. We've been testing the recently updated D3400. Though the updates are modest, the real question is can the camera still hold its weight against the competition? With decent low-light photos and a smoother-to-focus for movies kit lens, the D3400 remains a first-dSLR favorite. 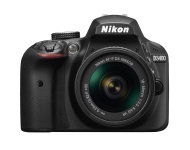 The Nikon D3400 delivers the image quality and speed that a first-time dSLR buyer should expect. A lot of the small annoyances from previous models remain, including tiny autofocus points in the viewfinder and a nonpersistent self-timer mode. Plus, its Bluetooth-only wireless solution isn't very good.